There once was a boy named Stefano who was the son of the famous pasta chef Farfalle - a chef known for his delicious and oddly shaped pasta. 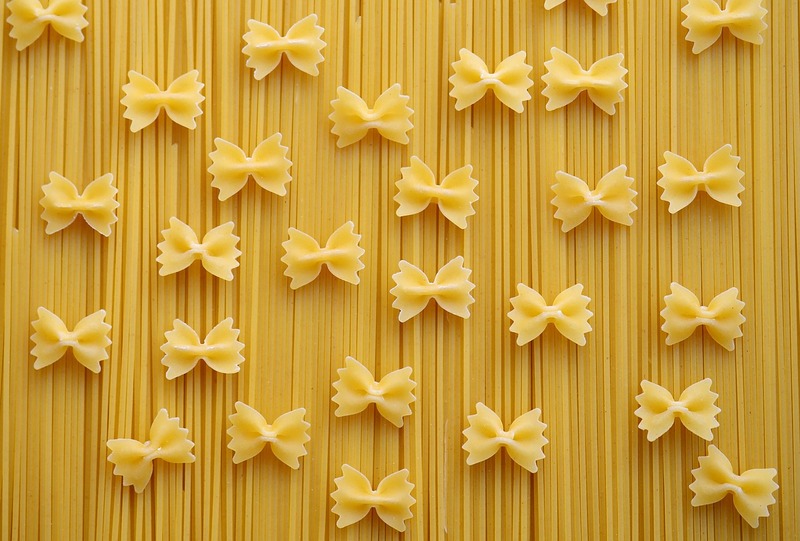 Now Farfalle was known across the land for his tie noodles so much so that the King himself inquired about them. One day while Stefano and his father were preparing to eat their supper, there was a knock on the door. Farfalle got up from the table and answered the door, and who would be there but the king himself! Farfalle instantly opened the door wide, invited in the king, and asked for what reason he was there. The King informed Farfalle that the renown of his noodles had reached his ears and that he simply must try them for himself. Having such a great honor bestowed upon him, Farfalle hurried around and started to make his noodles. Meanwhile, Stefano had slunk to the corner and out of the way of his father as he worked his magic. As Stefano was about to head out of the room and up the stairs, he heard a yell from the kitchen followed by a loud crash. Running into the kitchen to see what the matter was, he saw his father on the floor holding both his hands with a pot on the floor next to him. Stefano went to help his father up and while he was doing so the King walked in and demanded an explanation. Farfalle elucidated that, in his hurry, he had grabbed the hot pot with his bare hands, burned them, and consequently poured the boiling water on himself. He then stated that in this condition he would no longer be able to make the noodles. Outraged at having been denied his noodles, the King called for his guards and told them to kill Farfalle and Stefano. Stefano stepped in front of his father and told the King that he himself would make the noodles. The King halted his guards and told Stefano that if he could make noodles that pleased him then they both would live. The King then went back to the table to wait. Stefano helped his father up while his father inquired if he had ever made the noodles before. Stefano replied that he hadn't, but had watched him do it enough times that he knew how to by heart. So while Farfalle went out to join the King, Stefano started cooking. For half an hour, before the pasta was ready, various sounds could be heard and smells could be smelt. At last came Stefano carrying two dishes of noodles: one for the King and one for Farfalle. The instant the bowl was set in front of him, the King started to eat with a ravenous passion. The King finished the bowl of noodles in less than five minutes and set down the bowl in a quiet fashion. Now sore from tension, Stefano awaited the judgment of the King – fearing not only for his own life but the life of his father. After sitting in silence for what seemed to be the longest minute ever, the King let out a loud laugh and congratulated Stefano on his work. Farfalle breathed a sigh of relief and gave his son a hug that could have cracked a tree. The King asked Stefano what his name was, and when Stefano answered, the King let out an indignant scoff for no such name was fit for these noodles. The King told Stefano that he should be known as Farfalline and that his noodles, which has been better than any that had ever been made, should be named after him. And so the pasta known as Farfalline was born. Over the centuries, modifications have been made on its size and shape, but the noodle will always be known as Farfalline.